The restaurant chain recently announced plans to sell domestic brews such as Budweiser at select locations across the country. Undeterred by the gathering blizzard, more than 40 University Heights Secondary School students rallied on Thursday, Feb. 25 to protest their school’s planned transfer from Bronx Community College's campus. Governor David Paterson and State Park officials have proposed closing 55 parks and historic sites across the state, and reducing services at another 24, as they look for ways to dent the state’s $8.2 billion budget deficit. The office building at 151 E. Tremont Avenue could become a thriving hub of African culture, unless the recession sinks this deal too. Op-ed: The Bx and the Census – Perfect Storm for an Undercount? Soon millions of Americans will receive the 2010 census form in the mail. While we generally dread government forms, we should welcome this one. Thousands of west Bronx residents use mass transit every day and those services are vital to the quality of life we all share. A 34-year-old man died on March 1 after falling down an elevator shaft at 1749 Grand Concourse, an apartment building known as the Lewis Morris. Davidson Community Center has received a $200,000 grant to launch a healthy eating initiative aimed at battling obesity and diabetes. 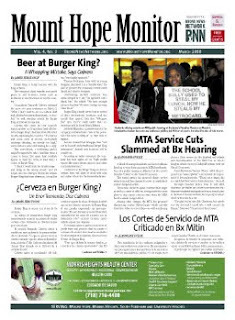 Click here for a PDF of the print edition.